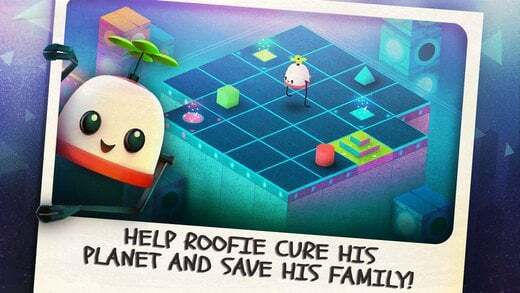 This week’s free app is the puzzle game Roofbot: Puzzler on the Roof. Normally it’s $3, but you can get it free from iTunes until Thursday, February 9th. It’s your typical figure-out-the-pattern game. Move the player in the correct order to get to the next level. Apple seems to like these for the free app of the week. This time we have a robot named Roofie (yes, that’s his name, so stop giggling) trying to save his family by getting to the next level. The premise seems too contrived. 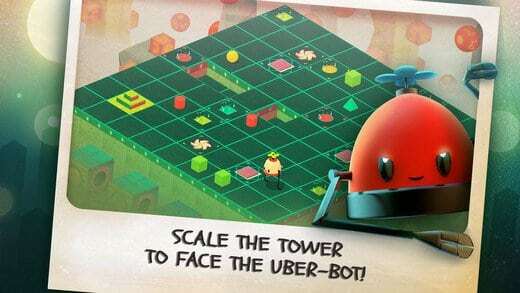 Roofbot’s graphics are cute, but not very detailed. They’re not quite retro, but nothing like the gorgeous games in this genre. The gameplay is awkward using swipes instead of tapping on where you want the player to go. When you get stuck, you can ask for a hint or redo the level. An in-app purchase lets you buy more hints. I’d suggest kids as the graphics are cartoonish with exaggerated movements that remind me of Wall-E. The game patterns are complex so the audience who might appreciate the cute robot and his family wouldn’t be able to play it. Those people who could play the game would find it childish; at least I did. The app takes up 156MB, which isn’t too much and it loads fine on older phones. I deleted it because there are too many similar games that have better graphics, gameplay, and sound.